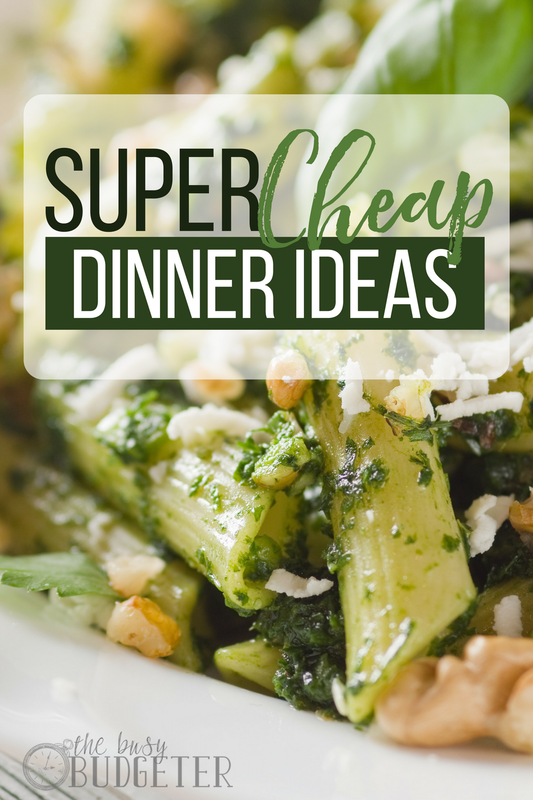 Start 2017 off with super cheap dinner ideas to help get your grocery budget under control! Is your grocery budget stretched a little…er…thin, some weeks? Food can be so expensive, especially if (like us) you’re trying to avoid the drive-through. We’ve had weeks where we HAD to come in under our $70/family-of-four limit. Some weeks, we’ve had to come in well under our limit—and that’s not always easy to do, particularly in a healthy way. 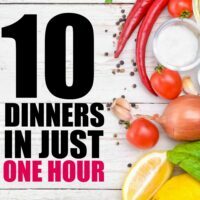 I’ve had to come up with inexpensive, easy meals that take less than 15 minutes to throw together. I don’t love cooking, nor do I have time to spend hours in the kitchen working on meals. I just don’t. I need something cheap, fast and reasonably healthy—and something my kids will enjoy! So what do you do when you’re trying to plan a menu on a very limited budget? 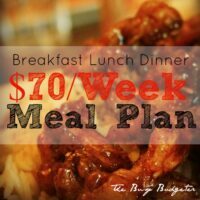 How can you really stretch those dollars and make dinners that are varied (at least somewhat), healthy, and don’t go over your budget limit? There are some workhorse items to add to your grocery list to really stretch things further, namely: rotisserie chicken, ground beef, rice, pasta, beans, tortillas and solid bricks of flavorful cheese. These items can be prepared once or incorporated into one meal on Monday night, and then turned around and be something completely different on Tuesday! Take rotisserie chicken, for example. It’s usually on sale and you can often find it for less than you could purchase and make it at home. (Plus, it’s much more convenient to just pick it up, ready to go, at the store.) 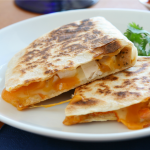 If you eat it plain, you might only have enough for one meal, BUT if you use it as a component of several meals, one night you can have chicken salad sandwiches, and the next night quesadillas or chicken strawberry avocado salad. 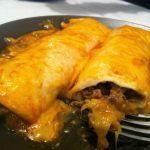 Ground beef becomes 15 minute sloppy joes (my family’s very favorite) one night and can be used in the easiest beef enchiladas ever the next. It’s all about using the same components in a different way. Beans, rice, tortillas, pasta and cheese can be incorporated into a variety of dishes as the base, and then, with just a little switching of veggies, meat and spices, you can create completely different dinners for multiple nights! Meat can be one of the biggest expenses in a grocery budget, so going meatless once or twice a week can really help to stretch your budget. Our family’s favorite meatless meals are broccoli cheese soup and ravioli with butter, yellow squash and zucchini. If your family doesn’t quite get behind the concept of meatless meals, try to get creative with the way you use it in recipes. Think of bacon as a garnish to be crumbled on top or use flavorful sausage where just a little goes a long way. Rather than eating a whole steak or pork chop, try sliced skirt steak in a fajita or shredded pork in tacos. When in doubt, offer up “pizza night” (instead of meatless night) or try pasta dishes where the meat is hardly missed. It can seem really convenient to buy pre-sliced veggies and prepared side items, but if you’re willing to chop, cook, and mash it up yourself, you can save quite a bit on your sides. Seasonal or frozen veggies make great, simple sides, so if your family has a favorite, buy it in bulk. A big bag of frozen broccoli, corn or peas can be portioned out into a side each day or incorporated into recipes to “up” your veggie factor. 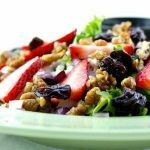 Often a simple salad on the side is plenty to accompany a sandwich or round out the meal. Sliced apples, carrot sticks or other crunchy goodies are kid-friendly, easy and healthy. To stretch your budget, tackle your groceries with a list and a menu plan. So many times I’ve gone to the store hungry and without a list—and what happens? Suddenly my cart is full, I’m over budget, and I’ve purchased a bunch of items that don’t incorporate well into my meals. Instead, try to be as organized as you can. You don’t have to write out all the steps or ingredients, but if you have a basic outline of what you want to make for the week, you’ll make choices that will keep you under your budget. Look for items where a simple swap would turn something into a double duty ingredient. For example, if you’re buying ingredients for stir fry—chicken, rice and veggies—you can easily incorporate them into soup, a chicken rice casserole, or taco chicken bowls later in the week. Sit down and create a plan for the week, including nights you might plan to go out and nights you won’t have time to cook (and will need a freezer meal or something to go in the crockpot). 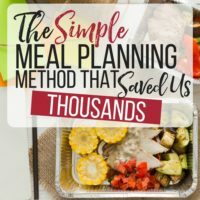 If you need help getting started, check out our meal planning for beginners guide for easy, step-by-step instructions. Make-ahead meals, meaning freezer meals, slow cooker meals, and dump (freezer-to-slow cooker) meals are all great ways to save money! You can often create them using the same ingredients or make multiple meals at one time. This saves you from having half a can of tomato paste or too many potatoes to use up. If you need help with freezer meals, you can use the MyFreezeEasy meal planner to make it super simple. The other great thing about make-ahead meals? 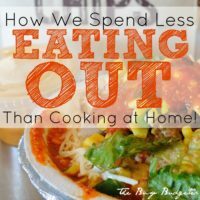 You save money because you don’t have to stress out about what to have for dinner! You already have a hot, delicious, nutritious meal waiting for you when you get home or after you make it through your day. There’s no stress about what to make or how to get dinner on the table, and you won’t resort to going out and spending money at a restaurant because you’re too tired to cook. For the nights you don’t have a make-ahead meal ready, try a 15-minute meal instead. These quick and easy dinners will have you putting something delicious and wholesome on the table faster than you could drive through a burger joint, and for less money, too! Pretty much everyone has heard of TV dinners. You know, the little trays with premade microwave meals right inside? While they’re convenient and sometimes cheap, you can make them yourself for much less, plus they’ll turn out much healthier! To learn all about making DIY TV dinners, visit our tutorial. They’re so easy, convenient and less expensive than the boxed dinners, plus they’re way healthier. 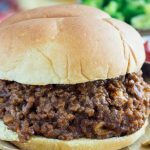 We’re also big fans of making extra food when we have a favorite meal like sloppy joes, chili, spaghetti or tacos. Some people aren’t so into leftovers, but items like soups and stews can be stretched over a few days, or used to create a dinner and a lunch to really maximize your savings. With a little planning and some smart strategies, you can save plenty on your grocery bills. Try to incorporate some of the ideas above and let me know if they’ve helped you stay under your budget! What are some ways that you are able to keep your groceries under budget? Love these tips, especially #1. I hate wasting food so this is a good one especially if you find a good sale. I think planning the menu is key. Sometimes when I’m in a rush, my mind blanks out and I find myself at a loss for what to make. Taking the time to plan a week or two ahead is so much easier. Nothing makes me happy than reading about cheap dinner ideas! #1 for me is very important.